Compact engine, minimal vibration: Engine vibration is kept to a minimum by using crank pins phased at 180 degrees and a balancer shaft behind the cylinders, which also contributes to the engine's compact size. Crisp throttle response: PGM-FI electronic fuel injection keeps the engine running efficiently in all conditions and ensures crisp throttle response and powerful torque at low to mid rpm. Runs smoothly at high output levels: Careful flow analysis of the cooling system resulted in a water pump that's small and lightweight, yet still more than capable of keeping the engine running its best at high output levels. High-tech design: A light and compact roller-rocker-arm assembly and shim-type valve adjustment allows a lower valve-spring load for reduced friction and a compact cylinder head. Improved durability: The pins in the silent cam chain have been treated with vanadium, which both reduces friction and improves durability. The lightweight pistons use the same advanced manufacturing process as those found in the CBR1000RR. 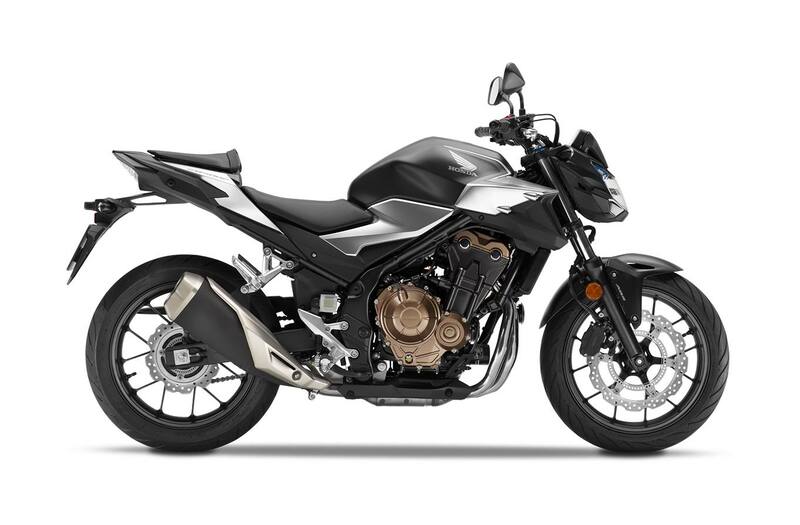 To ensure precise cylinder shape, the engine uses the same centrifugal-cast thin-wall sleeves as found in the CBR1000RR. The sound of power: The battery has been repositioned farther from the rear of the airbox intake duct to improve airflow, while the muffler now features dual exit pipes for a sportier sounding edge to the exhaust note. 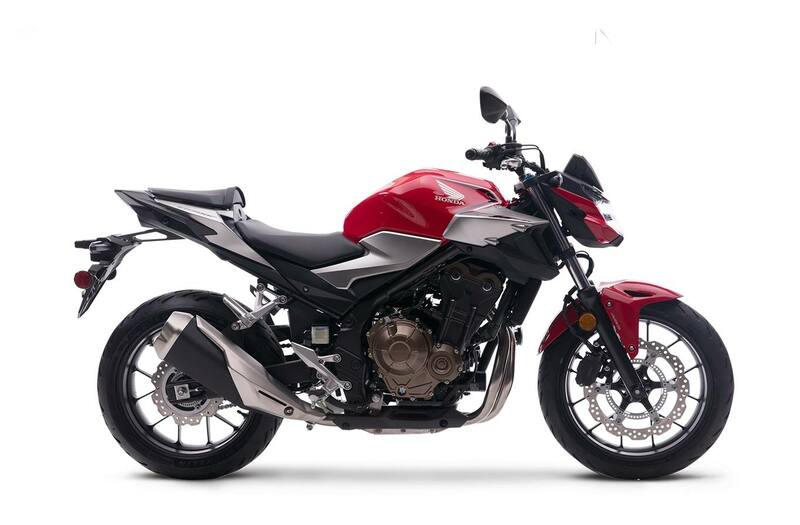 Easy to manage: The 785 mm seat height makes the CB500F very easy to manage, and its neutral riding position comfortably accommodates riders of any height. Reduced unsprung weight: Wave brake rotors with superlative heat-dissipating qualities are lighter than conventional discs of the same diameter, which help to further reduce the bike's unsprung weight. Lightweight wheels: Lightweight cast aluminum wheels with Y-shaped spokes not only look trick, they also contribute to the bike's excellent manoeuvrability. ABS braking control: A dual-piston brake caliper up front and a single-piston caliper at the back provide strong but easily controlled stopping power. Plus, the latest two-channel ABS modulators provide more accurate control and improved stability. Increased range: It not only looks more aggressive, but the redesigned fuel tank also boasts increased capacity of 17.1 litres, providing a range of approximately 480 km for longer rides and fewer stops. Aggressive look: Sleek bodywork incorporates an LED headlight, taillight and turn signals, and leaves more of the engine exposed for an aggressive, streetfighter look. Brake lever and wave key: Adjustable brake lever and wave-style ignition key add to the CB500F's long list of premium features.